It’s the last day of the Fair, arrive early and make the rounds to see and eat all you can before it closes! If you attended previous days of the Fair bring someone new and give them tour. Events start bright and early with the Pernat Haase Meats Four Wheel Drive Truck Pull at 9am in front of the grandstands. Local and district pullers from the Badger State Truck Pullers Association coordinate bringing a few of the pros and super trucks while locals compete in street diesels. From 11am to 5pm learn about animals and agriculture in the Family Farm Adventure Tent next to the Youth Building. The Family Farm Adventure Tent is filled with hands-on learning opportunities for kids of all ages. Activities will include agricultural crafts and visits from farm friends. Also, be sure to test your knowledge with our Wisconsin agriculture trivia for a chance to win fun prizes. Games include Wheel-of-Farming, Adventure Tent Plinko, and the Commodity Carnival. Enjoy the many Family FREE shows throughout the grounds starting with Pig Races at 12 Noon, Kandu Magic Show at 1pm and the educational Wild World of Animals show at 1:30pm. Show times continue throughout the day, view the entire schedule on our Sunday Fair Page. Rides and games on the midway will be open from 12 Noon to 7pm. Visit our Midway Rides Page for ticket information. Oooh and Ahhh at the Demo Derby as cars, trucks and vans crash it out till the last one moving wins. The afternoon Demo Derby starts at 1pm on the track in front of the Grandstand. Afterwards, pit crews will be busy preparing for the main event at 6pm. The Little Britches and Little Shepherds Showmanship Contests will make the crowd roar with laughter as kids between grades 4K and 4th demonstrate their showmanship skills. Starting with the Little Britches in the Farm Progress Area at 1:30 pm, youngsters lead their May or June dairy calf in front of the Judge. At 3pm stop by the Junior Livestock Barn to watch the Little Shepherds as they entertain and practice their skills showing sheep. Fashion at the Fair? Yes, of course! The 4H Clothing Style Show on the Radio Park Stage from 1 to 1:30pm. Area youth display their clothing and fashion projects entered in the Junior Fair. 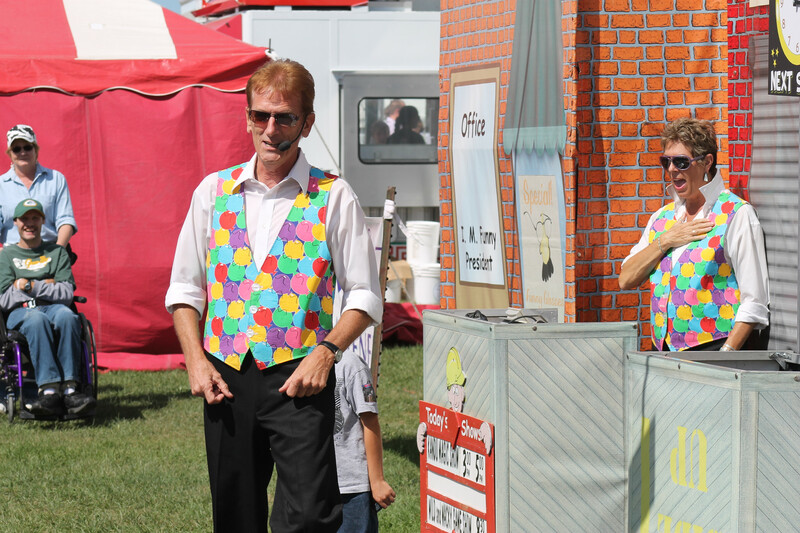 Howdy there, it’s time for Hee Haw at the Fair – The Husty Players will perform skits and music reminiscent of the television show Hee Haw from 1:30 to 2:30pm. At 2:30 enjoy music by Willie’s Shadow (a tribute to Willie Nelson), and then the Swingin’ Beavers dance their way through Radio Park during their square dance demonstration from 3 to 4pm. Finally, Willie’s Shadow (a tribute to Willie Nelson) is back at 4pm. Fans will fill the grandstands for the evening Demolition Derby at 6pm. Cars, trucks and vans will fight it out in final events based on results from the afternoon derbies. Cheer them on with your final bites of fair food and favorite drinks.